Earlier today, Apple released what you might consider an "unscheduled" iOS update, iOS 7.0.6. 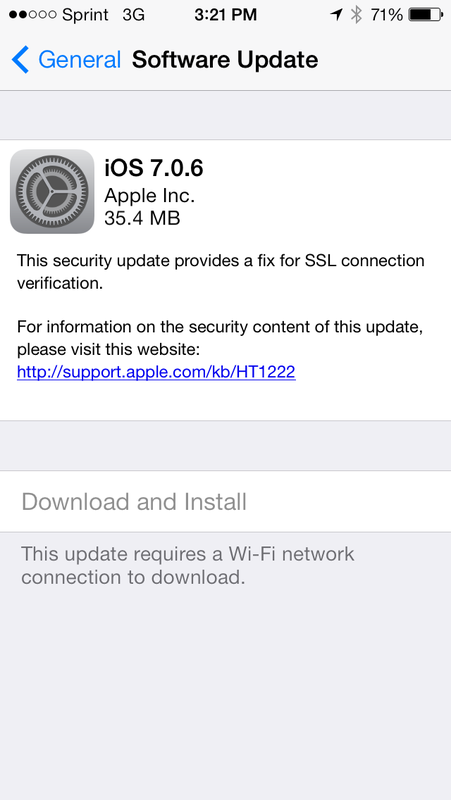 According to the notes provided in the summary screen, iOS 7.0.6 is a security fix for SSL connections. It doesn't look like the release notes have been replicated around to Apple's servers because I wasn't able to find mention of iOS 7.0.6 on the referenced Apple Support page. One can assume, however, that this update will be rolling out for current supported models of iPhones, iPads, and iPod touches. 9to5Mac has a note on their iOS update article that says Apple also rolled out iOS 6.1.6 to update the iPhone 3GS and fourth generation iPod touch handsets. After upgrading my iPod touch 4th-generation, it now lists iOS at version 6.1.6 (10B500).